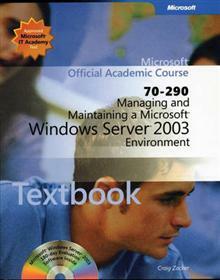 Provides information students need to build the knowledge and skills necessary to install, configure, administer, and support the primary services in the Microsoft Windows Server 2003 operating system and to prepare for the Microsoft Certified Professional examination 70-290: Man... read full description below. A comprehensive program of textbook, lab manual and software, this Microsoft Official Academic Course provides everything students need to build the knowledge and skills necessary to install, configure, administer, and support the primary services in the Microsoft Windows Server 2003 operating system and to prepare for the Microsoft Certified Professional examination 70-290: Managing and Maintaining a Microsoft Windows Server 2003 Environment. A complete set of instructor resources supports the book. Microsoft Corporation Founded in 1975, Microsoft (Nasdaq MSFT ) is the worldwide leader in software for personal and business computing. The company offers a wide range of products and services designed to empower people through great software any time, any place and on any device.